SalesAgility, the driving force behind SuiteCRM, is pleased to announce a new release of SuiteCRM, version 7.10.1. This is a minor release of SuiteCRM featuring several improvements and 38 bugfixes. At the same time the SuiteCRM 7.9.15 and SuiteCRM 7.8.16 (LTS) have been released. OAuth2 Clients and Tokens: which lets you manage what clients have access to the OAuth2 Server, view session log and revoke active sessions. To read the full release notes, please check the following pages: SuiteCRM 7.10.1 – SuiteCRM 7.9.15 – SuiteCRM 7.8.16 (LTS). With over 800,000 downloads, SuiteCRM is one of world’s most popular CRM applications. SuiteCRM is open source, and provides you with all the modules you need to helps increase sales, improve customer care and streamline business operations. You can run the fully featured SuiteCRM on-premise or on your cloud of choice, enabling you to stay in full control over your own data, and SuiteCRM the best choice for any business, enterprise and organisation. 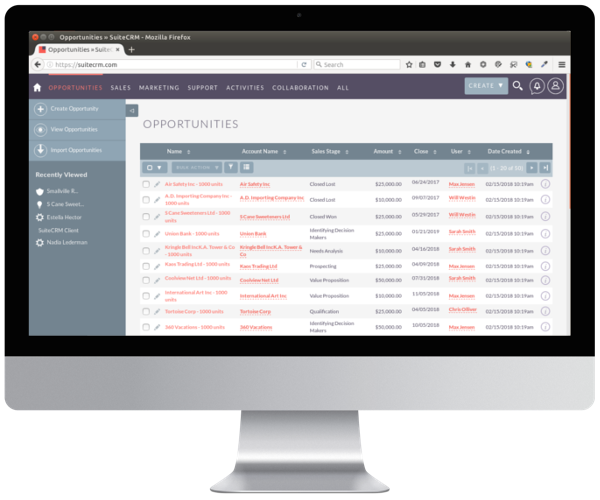 For an online demo, please visit our SuiteCRM demo page. I can’t log in, can’t get the login screen anymore, please help! !